Prof David Crystal's talk on "the future of Englishes"
Professor David Crystal (above, in glasses, with a white beard) - probably the UK's most famous linguist, who gave evidence to a Parliamentary committee on bureaucratic jargon in government - recently gave a (June 2012) talk at the University of Westminster on "the future of Englishes." Key points of Prof. Crystal's talk were that American English had developed within days of the first Elizabethan mariners arriving in the New World, when they started writing letters home with new words to describe new concepts - "moccasins", "skunk", etc. While even 20 years ago, non-native speakers would have been ridiculed for their very different intonation, Prof. Crystal notes that with non-natives now outnumbering native speakers four to one, we don't even notice a very different intonation in English anymore. Correction (03/07/12): Did I really say "we don't even notice"? Yes I did. What I meant to say, of course, based on my possibly imperfect understanding of what Prof. Crystal said, was that we hardly comment on a different intonation in English anymore, even if we do notice it. There is, of course, a difference. Prof. Crystal also quoted the Earl of Leicester's travelogue of his tour of Europe in 1582, in which he mentioned useful languages - Dutch, French, Italian, Spanish, but definitely not English, which has "no use beyond our shores." English didn't even have a literature, with "Father Chaucer" already incomprehensible after just 200 years. This was, of course, a very short time before two developments put English on the map - obscure Midlands poet William Shakespeare began writing sonnets, and the first English adventures in the New World of America started. I was at Professor Crystal's talk in my capacity as news and features editor of EL Gazette, global newspaper for the English language teaching industry, and put a question to the Professor about the likely effect that the wearable simultaneous translation computers currently in development will have on English as a lingua franca. Prof Crystal told me he reads every issue of the EL Gazette and that he'd noticed my byline was "all over every issue." The EL Gazette now has a Twitter feed twitter.com/elgazette and there's now an online tutorial on how to register with EL Gazette digital and search its back issues. A taxing question – can EFL teachers freelance legally? Update - 11/07/12 - The HMRC ruling that Teflers cannot in most circumstances be self-employment seems to have been repealed in April 2012. See the HMRC's ruling on this here. http://www.hmrc.gov.uk/manuals/esmmanual/esm4503.htm - Thanks to Sue-Lyon Jones for the update (@esolcourses on Twitter) via the EL Gazette's twitter feed. I hope to follow up on this ruling, unscramble what it means in English, and work out its implications for EFL teachers, in a future EL Gazette article. EL Gazette has recently heard of two more cases of EFL teachers being engaged by language schools on a self-employed basis - completely illegal in the UK as we at EL Gazette understand it. This feature - which first appeared in the EL Gazette of April 2011 - explains why. Engaging EFL teachers as self-employed and paying them fees without deducting tax or National Insurance (NI) contributions towards unemployment benefits is unusual enough in the UK to raise eyebrows. Can language schools hire teachers as freelances or does the law force them to take on teachers as salaried staff and make statutory deductions up front? And what about EFL teachers in other EU countries? Under the UK tax system both employer and employee pay NI contributions. Freelances are supposed to pay their own tax and (lower rate) NI. While it may be convenient for schools to have freelances on their books – no holiday or sick pay or unfair dismissal cases to worry about – if Her Majesty’s Revenue and Customs find out about this arrangement and the school can’t prove to HMRC that all its freelance teachers have paid tax, the school will be liable. The key document determining whether UK-based ‘teachers, lecturers and tutors’ have to be employees or can freelance is HMRC’s ESM 4503. This clearly states that anyone teaching ‘in the presence of their students’ in ‘an educational establishment’ or ‘anywhere indoors and outdoors where instruction is given’ must be an employee and can’t freelance. ESM 4503 allows lecturers to be self-employed only if they teach less than ‘three days in three consecutive months’ or give lectures only to the general public. EFL teachers who arrange private lessons and charge students directly can freelance. ‘Trainers’ aren’t included in ESM 4503 and there may be cases where freelance business English trainers are paid directly by the company whose students they teach, with the school taking a finder’s fee, or arrangements where teaching co-ops hire classrooms from another school and are paid by their students. Otherwise, forget EFL freelancing. The Inland Revenue (precursor to HMRC) raided Oxford Street’s language schools, once in the late 1980s and again in 1997. Every school we’ve heard of has lost such cases against HMRC. And in other countries? In Ireland, where employee deduc tions are for Pay Related Social Insurance, it’s generally hard to engage freelances. Courts have ruled that contracts stating ‘you are responsible for your own tax affairs’ have ‘little validity’. In Spain salaries are quoted net of tax except for a small proportion of NI. Employers are responsible for all other taxes. Tax is complicated enough for many Teflers in Spain to sign up to companies such as Sapic, which charge annual fees for handling all the invoicing, tax and social security affairs of teachers on its books. It’s worth being an autonomo if you earn €20,000 (£16,900) or more a year. It’s hard to freelance in France, where the default setting is to be a pigiste, paid a kind of pro-rata salary for work for clients with a hefty chunk deducted towards social security. The Netherlands seems relatively easier to freelance in. Much of its private-sector EFL is in-company business English training with hours, supervision and equipment determined by the client more than the language institute. The June 2012 online edition of the Freelance is now up. 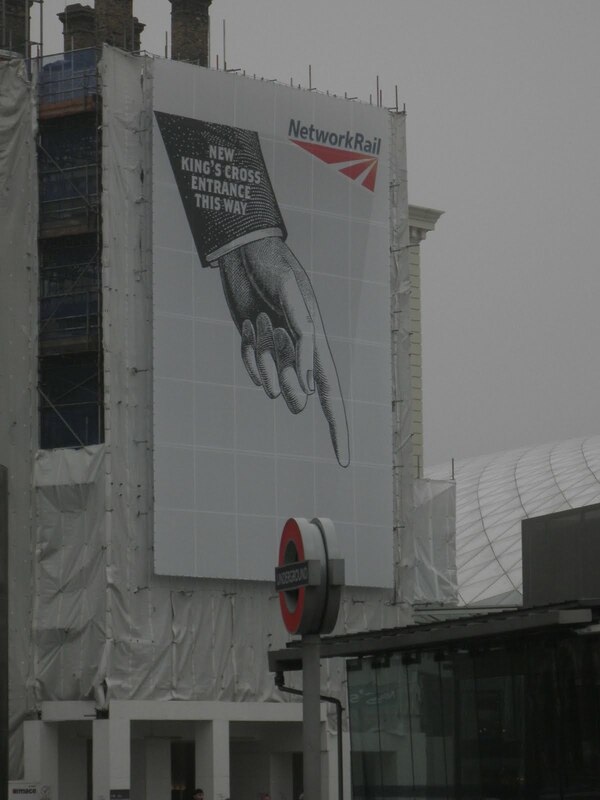 Good to see that Network Rail - not normally known for their sense of humour - have allowed themselves to be inspired by Monty Python in their latest temporary signage at their new King's Cross development.